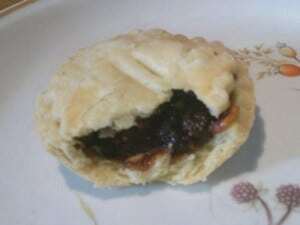 A modern day mince pie - made by me! The modern day British Christmas, with its Christmas trees, mincepies, Christmas cake, Christmas pudding, turkey and all the trimmings, Christmas cards and Christmas crackers, has most of its roots in the Victorian era and is light years away from how Christmas was celebrated in Medieval and Tudor times. So how was this important religious festival celebrated in Tudor times? Advent, the four weeks leading up to Christmas, was a time of fasting which did not end until Christmas Day. Alison Sim, in “Pleasures and Pastimes in Tudor England”, writes of how Christmas Eve was particularly strict and Tudor people were not allowed to eat eggs, cheese or meat. On Christmas Day, the festive celebrations began early with a mass before dawn and then two further masses later in the day. Church congregations held lighted tapers as the genealogy of Christ was sung and then they went home to enjoy a well-deserved Christmas Day feast. The main days for celebration at this time of year were Christmas Day, New Year’s Day and Epiphany (Twelfth Night), although there were further celebrations during the Twelve Days of Christmas for saint’s days. The actual first day of the new year in Tudor times was the 25th March, the Feast of Annunciation, which celebrated the Angel Gabriel telling Mary that she was pregnant with God’s child, but the Tudors also celebrated New Year’s Day on 1st January, which was a throwback to Roman times when January 1st was the start of the calendar year. The mutton in the pie would be to symbolise the shepherds to whom the Angel Gabriel appeared. Henry VIII was one of the first people to have turkey as part of his Christmas feast, after the bird was introduced into Britain in the 1520s. It soon became a popular meat, but such feasting was only enjoyed by those of high society and not by the masses. The famous Tudor Christmas Pie was a coffin shaped pie crust containing a turkey stuffed with a goose which was stuffed with a chicken which was stuffed with a partridge which was stuffed with a pigeon – phew! If that’s not enough, the pie was often served with hare, game birds and wild fowl. Now you know why Henry became so large! This tradition involved a log being brought into the home on Christmas Eve, being decorated with ribbons and then lit and kept burning through the 12 days of Christmas. It is thought that this tradition had its roots in the midwinter rituals of the early Vikings who built huge bonfires for their festival of light. People thought it was lucky to keep some charred remains of the Yule log to light the next year’s Yule log. The chocolate Yule Logs that we buy at Christmas today are a reminder of this old tradition. The way that a monarch responded to a person’s gift was very telling of who was in royal favour. In 1532, Henry VIII refused Catherine of Aragon’s gft, while accepting the one from Anne Boleyn, and Elizabeth I famously refused the Duke of Norfolk’s gift of a beautiful jewel in 1571 because he was in the Tower of London for being involved in a revolt against the crown. A monarch was meant to respond to gifts by giving the giver something in return, and it was expected that they would give them something more expensive than the item that had been given to them. As in many Catholic countries today, the most important feast day of the year was Epiphany (6th January) or Twelfth Night, on the eve of Epiphany. Epiphany would be celebrated with a church service and then lots of feasting and entertainment, such as a masque. On the 6th December (the feast of St Nicholas), Tudor people would often celebrate the Boy Bishop, a tradition which had been going on since the 10th century. This tradition would usually consist of a boy from the choir being chosen to lead the community and do everything apart from leading the mass, from Vespers on the 27th December until the 28th December (Holy Innocents’ Day). Sim writes of how Boy Bishops would lead processions around their communities, collecting money for the church and parish funds, and that the Boy Bishop of St Paul’s Cathedral would lead a procession through the city of London to bless the city. The tradition of the Boy Bishop went on until 1541, when King Henry VIII banned it, perhaps because he felt that it was mocking Church authorities and himself as head of the Church. Although the tradition made a brief return in Mary I’s Catholic reign, it disappeared again in Elizabeth I’s reign. The Cathedrals of Hereford and Salisbury actually still continue the tradition of Boy Bishop today. The Lord of Misrule was a popular part of Tudor Christmas traditions and involved a commoner playing the “Lord of Misrule” and supervising entertainments, drinking and revelry, and, in general, causing chaos. Sim writes of how the tradition was not solely a Christmas one and how a Lord of Misrule often supervised summer parish festivities, sometimes disrupting church services and causing trouble. Although their father and half-brother had been keen on this tradition, Mary I and Elizabeth I were not so keen. Mary did not celebrate it and Elizabeth discouraged it because of her disliking of the public disorder that it caused. Although many people link the word “wassail” to Victorian times, the word actually comes from Anglo-Saxon and means “your good health” or “be whole”. Wassailing was a popular traditon of the Tudor Christmas season and its focus was the wassail bowl, a wooden bowl containing up to a gallon of hot ale, apples, spices and sugar. We do not have much information about wassailing in Tudor times but there is one description from the reign of Henry VII which describes a very formal occasion where the steward and treasurer were present, along with their staves of office. The steward would enter the court with the “wassell” and cry out “wassell!” three times and then the people would reply with a song. Although this sounds rather formal, Sim is of the opinion that, in general, wassails were more informal and that it was common for people, even of “high” society, to share a communal wassail bowl of drink. At the bottom of the wassail bowl was a crust of bread which, at the end of the wassail, was presented to the most important person present. Apparently, this is where our present day tradition of “the toast”, at wedding receptions and parties, comes from. In areas with orchards, people would go out to the orchard and drink to the orchard in the hope of having a good crop of fruit. The word “carol” comes from “caraula”, in Latin. or “carole”, in French, which both mean “a dance with a song”. Carols were an important part of the Tudor Christmas and were a way to tell the Nativity story and to celebrate it. The tradition of singing carols and dancing died out when the Puritans banned such Christmas festivities in the 17th century, but the singing element was revived in the Victorian era. Plough Monday was the official end of the Twelve Days of Christmas and was when work on the land began again. Most farmers would take it in turns to use a communal plough which was often kept in the church during the Twelve Days of Christmas. Often, a plough light would be kept burning before the Sacrament or Rood until Plough Monday, when the younger men of the parish would collect the plough, harness themselves to it and drag it around demannding money from people and ploughing up the ground in front of their door if they didn’t give them some money. In 1538, Henry VIII banned the plough light in churches and ten years later Edward VI banned the Plough Monday festivities completely. Remember the Anne Boleyn Files Advent Calendar! Wonderful. Really enjoyed this, Clarie. Thank you. Claire, this is such a great article, you should re post it for this Christmas. I really enjoyed reading how stepped in tradition Tudor Christmas was. Its such a shame many traditions have faded out over time. I also learnt where some things originated from. I finally know what a Wassail is! THank you Claire you just answered a 12-year old question for me! It was very intresting to read, well written as per usual. It was fun learning about the traditions that Henry VIII and his children had at their courts. Wonderful article, thank you very much!!! Wonder what carols they sang? I really enjoyed this! Since the holiday will soon be here, I been curious as to traditions during Tudor times.Im interested in Wassailing and foods as traditions. I have made Hippocras wine. The rescipe I used was a very good 1 bottle Red Burgundy wine 5 cinnamon sticks 6 whole cloves and small piece whole peeled ginger smashed I stem Rosemary 1 stem Tyme instead sugar I put honey to sweeten bring to boil let seep to warm transfer to crock pot on low covered . By this time take out all but cloves& cinnamon. Serve hot. It’s really great. Henry used it as an appertif for health than a drink. At Christmas 1484 Richard iii had a great feast with lots of wassailing and what was called a raucous noise. His neices were present and it was a sumptuous affair. He invited special large numbers of musicians to play in addition to his court musicians, but after several gallons of wine they were somewhat off key and wild. Richard ordered that they play loudly and merrily and oh boy did they, causing this chronicle to call it a raucous noise. The amount of feasting he also disapproved of, but the vast number of local ordinary people invited to a free knees up and food seem to have had a great time. I want to try and make some Tudor mince pies! How do you interpret ” “take the fattest of the broathe of powdred byyfe”? Take the fattest of the broth of powdered beef, so beef stock I’d say.